Contessa’s filly is almost a tiny replica! You cannot but fall in love with this joyful sprite, with her pretty china-doll appearance, her flashy colouring, long legs and happy nature. I’m calling her Sonnenschien – as she really is a ray of brightness. By the wonderful sire Sir Donnerhall (Sandro Hit / Donnerhall), who convincingly won his SPT in 2005, then became Bundeschampion and Reserve World Young Horse Champion in 2006, she has charisma and athleticism built in! 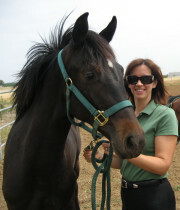 Contessa’s sire, Contendro, was himself SPT Champion. His offspring have won numerous jumping competitions, and been highest-priced sellers at the last 2 Verden Auctions. Sonni’s grand-dam, SPS Ester, carries the blood of Champions Eiger I and Wenzel I. I believe this wee one will be a credit to her lineage. 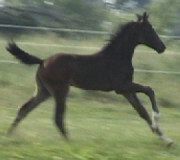 This typey filly wss SOLD to a wonderful dressage home in California. UPDATE: At Sonnenschein’s Inspection she was named Best Filly, on the basis of her feminine type, athleticism, conformation and rhythmic, elastic movement. 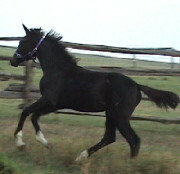 She was full of beans, and showed off her jumpiong ability as well as her dressage potential!